Despite its image as a mecca for party and summer holidays, the Balearic island Ibiza has been announced an UNESCO World Heritage Site in 1999 (WHC, 2011). The island was declared as both, a site with natural values and cultural importance. Ibiza is situated in the Balearic Sea, approximately eighty kilometers east of the Spanish mainland (Justmaps, 2014). The island provides an excellent example of the interaction between the marine and coastal ecosystem. Apart from that, it preserves a long history and the old town of Eivissa (Ibiza town) contains unique ancient architecture and history. The UNESCO declared the Spanish island a World Heritage Site for five major reasons, two on the natural part and three cultural assets (WHC, 2011). Due to its shoreline and marine life, Ibiza is considered a natural World Heritage Site. In fact, a huge colony of sea grass called Posidonia was discovered south of the island in the “Ses Salines d’Eivissa I Formentera” protected area (WHS, 2014). This is the largest Posidonia reef that can be found throughout Spain and the Mediterranean and is furthermore considered the world’s oldest organism, with an age of around 100,000 years (Oceana, 2014). While this significant sea grass is threatened in most Mediterranean locations, it is well preserved in Ibiza. On top of that, the evolution of Ibiza’s shoreline is one of the best examples of the influence of Posidonia on the interaction of coastal and marine ecosystems. Posidonia produces double the amount of CO2 as the rainforest, is habitat to various species and stops the erosion of beaches, just to mention three major values (WHC, 2011). Three unique reasons make Eivissa town a World Cultural Heritage Site, the 16th century fortifications, Phoenician ruins and the fortified Upper Town (WHS, 2014). 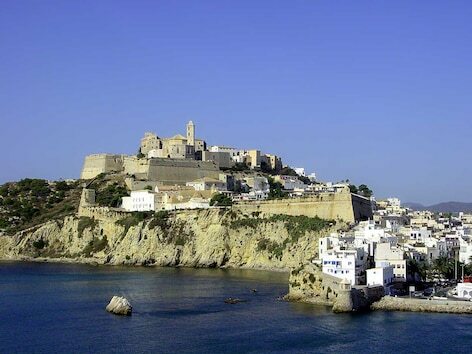 Ibiza's ancient capital has a long and diverse past, dating back to intact fortifications from the 16th century. Military architecture and engineering, as well as aesthetic features of the Renaissance mark Eivissa town (WHC, 2011). Remnants of the medieval walls and traces of Moorish and Carthaginian fortifications are witnesses for a history that dates back 2000 years. Phoenicians, Carthaginians, Romans and Moors all settled on the island before the Catalans took over in the 13th century (Cook, 2014). As stated by the UNESCO, the Phoenician ruins found on the island, constitute a unique resource and the Upper Town of Ibiza is an excellent example of a fortified acropolis that has not faced changes ever since (WHC, 2011). Ecosystems are extremely fragile, concerning external influences. Marine biologist reported that this has also applied to the case of the posidonia reefs south of Ibiza. They measured an average decrease in posidonia meadows of 20% between 2008 and 2012, caused by dozens of vessels that moor there illegally destroying the plants with their anchors (TSWFPA, 2013). With mass tourism flows during the summer, it seems hard to control vessels passing the area. Especially, considering that stakeholder opinions in economic and environmental goal settings, most likely vary a lot. The massive tourist numbers offer a lot of opportunities for stakeholers with private business interest to make a lot of money. This interest group clashes with stakeholders that are rather involved with the cultural values of the island. However, a cooperative approach including all involved stakeholders and the installation of environmental buoys could achieve to limit the numbers of vessels and hence, protect a major world natural heritage site. A high potential for collaborative activism was shown on the island already, when conservationists, locals, politicians and tourist chiefs united against the creation of an oil platform off the coast of Ibiza. Clearly, this would be a great threat for the islands coastal and marine life, but local stakeholders are doing their best at protecting the site, which is a promising base of protest (Vaughan, 2014). With tourism having become a key policy for urban renewal and gentrification, Ibiza’s old town is likewise facing changes. The expulsion of the current mix of local residents by wealthy international clientele and therewith the change of atmosphere and housing upgrade that goes with gentrification, might lead to a loss of the ancient flair of the old town and a loss of cultural values practiced by recent inhabitants (Pons, Salamanca & Murray, 2014). This process might also be triggered by the expansion of the port of Ibiza that potentially impacts the marine component of the World Heritage property as well as the cultural one. The World Heritage Committee by invitation of the State Party of Spain therefore reviewed the port expansion project, evaluated its Environmental Impact Assessment, and assessed the state of conversation of the property, its conditions of integrity and authenticity in November 2009 (WHC, 2010). The overall conclusion was that the current state of conservation was satisfactory. Nevertheless, some limitations were introduced to protect the World Heritage Sites. All in all, there are several threats to the Heritage Sites, with Ibiza being a popular tourist destination. However, some collaborative approaches, as in fighting against the oil platform, together with the control of the World Heritage Committee concerning the habour expansion, show some effective management attempts. Cook, W. (2014) Ibiza and the historic town of Eivissa. [Online] Available from: http://www.theguardian.com/spanish-t...c-town-eivissa [Accessed 16/11/14]. Focus (2014) Die schönsten Buchten zum Träumen. [Online] Available from: http://p5.focus.de/img/fotos/origs67...iza-stadt2.jpg [Accessed 15/11/14]. Justmaps (2014) Maps of Ibiza. [Online] Available from: http://www.justmaps.org/maps/images/...ibiza-map1.gif [Accessed 15/11/14]. Oceana (2014) Balearic Islands: Posidonia. [Online] Available from: http://oceana.org/sites/default/file...etos_15932.jpg [Accessed 14/11/14]. Pons, A., Salamanca, O. & Murray, I. (2014) Tourism capitalism and island urbanization: tourist accommodation diffusion in the Balearics, 1936-2010. Island Studies Journal , 9 (2), pp. 239-258. Schwalbe, I. (2009) Ibiza, Biodiversity and Culture. [Online] Available from: http://whc.unesco.org/en/list/417/gallery/ [Accessed 14/11/14]. The Scottish White Fish Producers' Association (2013) World. [Online] Available from: http://www.fishnewseu.com/latest-new...tage-site.html [Accessed 15/11/14]. Vaughan, A. (2014) Ibiza unites against oil prospectors. [Online] Available from: http://www.theguardian.com/world/201...learic-islands [Accessed 15/11/14]. World Heritage Convention (2010) State of Conservation (SOC) Ibiza, Biodiversity and Culture. [Online] Available from: http://whc.unesco.org/en/soc/499 [Accessed 16/11/14]. World Heritage Convention (2011) Ibiza, Biodiversity and Culture. [Online] Available from: http://whc.unesco.org/en/list/417 [Accessed 14/11/14]. Worldheritagesite (2014) Ibiza. [Online] Available from : http://www.worldheritagesite.org/sites/ibiza.html [Accessed 15/11/14]. I was already impressed of the presentation, the stereotype of Ibiza was only known for me, this is an extension. The only thing that I would like to know, if there is a disagreement between stakeholders desires what these differences are. But overall, I enjoyed reading it! This would be an interesting part to include into this page. I will research about the stakeholders situation a bit more and include my findings. I hope my small changes satisfy what you wanted to know about the stakeholders a bit. There hasn't been any interviews or reports about it so far, so my answer is rather general. The big conflicts are mainly between stakeholders with economical interest that see the island as a perfect setting to make a lot of money, no matter what that (for example high story buildings on sites with cultural value) means for the heritage value of the island. They then clash with stakeholders that strongly want to keep their cultural and natural heritage (these people could be locals, environmentalists, historians, etc.) rather than exploiting these assets for economical reasons. It would indeed be interesting to examine these differing oppinions closer and talk to some of the stakeholder personally. Maybe I will get the chance to do that one day. Thanks for your comment Albina! I am likewise very interested into the gentrification discussion, as it is a process that can be seen in many urban locations in different countries. Therefore, cases that showed the dramatic change of urban quaters should be evidence enough for the local government to turn this development around. However, I sadly couldn't find concrete steps against the gentrification process. The Ibiza Preservation Fund states that effective action to protect the old town is lacking. Positively stated can be only that a Programme was launched by the Ibiza government in 2008 to encourage local involvement in cultural heritage conservation. This has generally contributed to raise public awareness, hopefully also for gentrification issues. But the task ahead is still vast (http://www.ibizapreservationfund.org/issues-of-concern/). As this case has so rarely been researched, it would be quite interesting to do look at it more closely and raise awareness. I will consider it for my term paper.